For decades, lighting control in commercial spaces amounted to either on or off. Easy, simple, but not very effective when it came to workplace productivity in offices, boardrooms, and classrooms. Lighting control eventually evolved in the form of light sensors, motion sensors and electro-mechanical timers. It was better, as it helped cut lighting energy costs by automatically turning off lights when not needed. Even so, the technology was still limited to either on or off. Dimmers helped by adjusting light levels. But the technology was still manually operated for the most part. Additionally, the overhead lighting level was typically one-size-fits-all for everyone in the room and in most cases, commercial buildings still wasted energy because of excessive lighting levels. Research shows that personalized lighting control not only saves energy, it increases worker productivity. Task-based lighting, controlled by the worker, is key to an efficient working environment. For example, paperwork often requires a brighter environment than computer use. Personal comfort levels or age-related issues should also be considered. As people get older, they may need a higher lighting level than younger adults. When a worker can adjust his or her personal light level, productivity increases. But, there's an additional benefit you might not realize. Many workers will opt for dimmer lighting than brighter. That uses less energy, and without knowing it, they help save on utility costs. Lighting in open office areas and meeting rooms can be enhanced by incorporating daylighting strategies that utilize automated shades. This allows the building owner to save on energy costs and it creates a more productive environment by balancing artificial lighting with natural lighting. This can be automated or controlled by individualized software solutions that allow on-demand customization. In larger office areas, utilizing a dimming strategy can increase artificial lighting in the sections further from the windows. 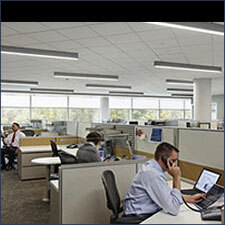 Areas in proximity to the natural light can be dimmed to minimize glare and increase savings. We've come a long way from toggle switches and manual dimmers. Today's buildings are smarter and more energy efficient because of integrated lighting control systems and shading technology now on the market.